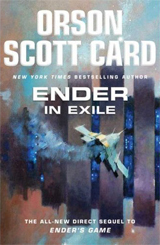 Description: Ender in Exile is a direct sequel to Ender’s Game and it is followed by Speaker for the Dead. It begins with the short story Ender’s Homecoming from Card’s webzine Intergalactic Medicine Show. Other Ender’s Game short stories that were published elsewhere are included as chapters of this novel, including: A Young Man with Prospects, Ender in Flight and parts of The Gold Bug. “In Ender’s Game, the world’s most gifted children were taken from their families and sent to an elite training school. At Battle School, they learned combat, strategy, and secret intelligence to fight a dangerous war on behalf of those left on Earth. But they also learned some important and less definable lessons about life.